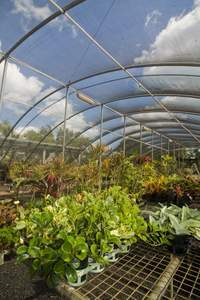 The Charles Darwin University horticulture team will be on hand to show green thumbs how to conserve water in their gardens as part of this year’s Tropical Garden Spectacular and Sustainable Living Festival at the George Brown Botanical Gardens at the weekend. CDU’s award-winning plant nursery water recycling system, which was implemented in 2011, is the first system of its kind to operate in the Northern Territory, and saves hundreds of thousands of litres of water a year. CDU Horticulture and Aquaculture team leader Scott McDonald said the display would feature demonstrations of an aquaponics system, and a water catchment system that was similar to the one installed at the CDU plant nursery. “The technologies being used in this project can be adapted to many different uses in both domestic and commercial situations for most types of water recycling and is a model for sustainable water management,” he said. Mr McDonald said CDU staff would be on hand to talk with people who were considering a career in horticulture or aquaculture. The Horticulture and Aquaculture team will also compete in the Landscape Olympics at 10.30am on Saturday, and will be involved in panel discussions and talks throughout the weekend. People wanting to become part of the Lakeside Drive Community Garden can find out about upcoming workshops called Bumblebees, where they can learn about organic gardening in the tropics, reusing waste and addressing the impacts of climate change in their own backyard.